I happened upon some Buz Sawyer reprints lately and thought it might be interesting to give them a peruse. These particular ones are from Pioneer circa 1988. They took a somewhat uncomfortable approach, in that they re-worked all of the art to fit the traditional pamphlet comic format. So the size of text and line weights vary all over the place, and the level of detail for any given panel stands a good chance of not making sense. Plus, the story beats seem a little weird since it's clearly written AS a newspaper strip, with a pretty regular 3 and 4 panel beat, but the page layouts don't follow that at all, putting the story beats all over the place. But that was Pioneer's doing. I was more interested in seeing what Roy Crane did originally. It was definitely a strange experience reading through the stories. In the first place, these early strip were written and are set squarely during World War II. Which means that it comes across largely as propaganda for the stars and stripes, apple pie, baseball and the American dream. Further, the casual attitude towards killing Japanese and German soldiers was somewhat disquieting. I mean, I know that the countries were at war and that there was a pervasive notion that all Japanese were inherently evil, but the sheer excitement some of the characters have at the prospect of shooting at them was unnerving. "More ammo! More ammo! Hot dingies, I never saw so much shooting in my life! Watch 'em fall! Watch 'em fall! Whee!" The writing, at least in those early stories, is steeped in the American value system of the time. So it's jingoistic and sexist and bigoted, and presents itself as all of those attitudes are not only normal but almost demanded. I mean, I've seen movies and read other comics from the same period, and I get that there was a different mindset that you have to take into consideration when revisiting them decades later, but this seemed mean instead of just ignorant. I also had a little difficulty with the art. The characters were all drawn rather comically, as one might expect in a comic strip. But the planes and ships... they all had a gorgeous hyper-realism that I would not have expected in a daily newspaper strip. Particularly some of the close-ups of the engines? Wow. Crane had some serious drawing chops! I'm familiar with the notion of drawing the characters and the background at different levels of detail to engage the reader on different emotional levels, but the disconnect here was that ONLY the planes and ships were drawn realistically. Everything else (desks, office equipment, trees, etc.) took on the same cartoonish quality as the characters. It seemed to me more like Crane was using the strip as an excuse to draw cool planes and ships, and the rest of it was just crap he had to throw in there so someone would pay him. Now I'm sure that the strip was viewed differently when it was initially published. Totally different time, with different expectations and all that. But I've rarely seen a work of any sort that was so successful (Buz Sawyer ran from 1943 until 1989) and hold up so poorly. I mean, I'm sure it changed somewhat with the times, but re-reading those mid-40s strips here in 2011 was really difficult for me. 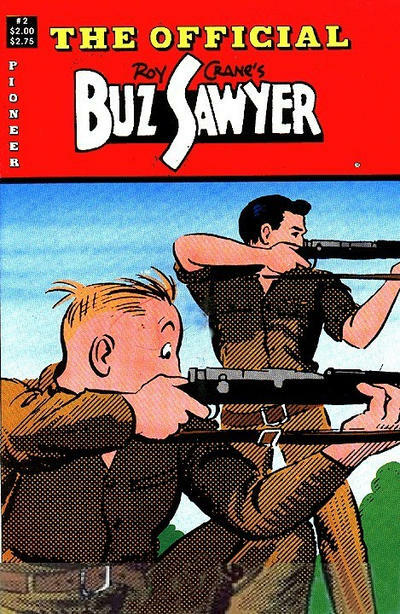 I've read plenty of comics and seen plenty of cartoons from that same period where the creators were clearly waging their own war on the Japanese and Germans, but it was always in the service of making America and democracy safe, never for the sheer joy of killing.